After the Protestant uprising of the Bohemian estates against the Catholic Habsburgs resulted in Thirty Years’ War and a final defeat in the battle of White Mountain Habsburgs took their revenge and executed some of the key leaders of the uprising, although with some others the punishment was reduced and some were pardoned. Prague’s executioner, Jan Mydlář stood ready with four sharpened swords. Twenty-four of the nobles would be beheaded that day and the other three would be hanged. 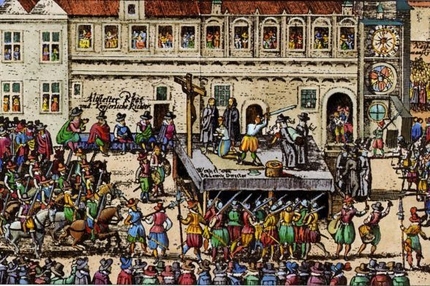 A contemporary drawing of the scene shows two bodies dangling from a beam protruding from a window in the Old Town Hall, while another hangs from a gallows in the area where the statue grouping of Jan Hus stands today.